Suborder: Apocrita Superfamily: Chalcidoidea In essence, a "Pteromalid" is any member of the Chalcidoidea that has 5-segmented tarsi and does not have the defining features of any of the remaining families with 5-segmented tarsi. There is no question but that this family will be divided into several families in the near future. 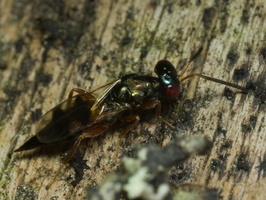 Pteromalidae is a very large family of parasitic wasps, with some 3,450 described species in some 640 genera.